Like most global corporate media conglomerates, TIME-Warner (which includes CNN) is unrelenting in its promotion of war and idealization of military duty. A new Nuremberg should one day include media barons and their top hirelings as defendants for high crimes against humanity. Editor’s Note: Our special blog on culture and politics — and countless other topics— VOXPOP uses a dialog format between its co-editors, Guy Zimmerman and John Steppling, both playwrights. This is just one of many excerpts from what is truly a unique public epistolary. The entire MoveOn.org ad spectacle was a perfect example of both the trivializing of American politics, and of the seemingly endless adoration this society has for the military. It was also yet another blow to free speech. The erosion of the first amendment (and the second, and the….) is now at critical mass. Is there any free speech anymore? Well, only in a prescribed fashion, in limited less than public ways. The mantra of this worship of authority and militarism is “support the troops”. I will say again, no, I don’t support the goddamn troops. I feel compassion for those young men and women foolish enough (and economically coerced enough) to join up, but I don’t support them. This worship of militarism is an interesting topic, however. The psychological tributaries include racism, patriarchy, authority. The public discourse on the MoveOn ad was mostly pure jingoism. The Democrats ran away scared of this trope of patriotism; all wrapped in the endless mantra of “support the troops”. How do you support troops by sending them to die in an Imperial war of profit? Why don’t the American people ask why there are no children of congressional leaders at the front? Why isn’t it clear Cheney and Bush and all the rest of these morally bankrupt rodents never faced an enemy with a gun? No, the worship of militarism runs deep in the US psyche. The acceptance of a two billion dollar a day defense budget speaks to the lack of critical awareness in the US public. 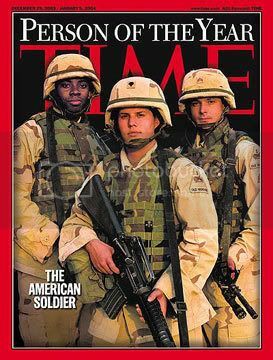 But I keep returning to the knee jerk embrace of the military icon wherever it surfaces … and it surfaces a lot in the mainstream media, in both Hollywood and in TV and print media. Now, let’s also remember just how NOT radical MoveOn.org really is. Supporters of war mongering Democrats, this is not exactly a leftist or progressive organization — and yet it is still a target for the ruling class power structure. When Amahdinejad speaks at Columbia, the cartoon jingoism is trotted out immediately. It is, as Pat Buchanan again says, *infantile*. Yes, it is, but it’s part of a process of infantilization that has been going on for a while now. The military scares people …. to criticize it means you make yourself a target. Authority works that way. We internalize authority and it’s one of our first experiences as children. So, free speech is marketed as wimpy, as a sissy ideal, while real men react aggressively — usually with physical violence. The MoveOn.org ad controversy and the Iranian president’s request to go to ground zero, are only the latest in political theatre. Both are designed to help create public support for the coming attack against Iran. If one looks at just the creation of US military bases around the globe, one sees the desire for Empire. The US has [major] bases in something like 60 countries, and probably more at this point. There is controversy from local populations (Okinawa, Puerto Rico, etc) because these bases are little tidal pools of violence and repressed anger. The surrounding area is usually awash in prostitution (both straight and gay) and with lewd public behavior. This theme returns again and again to our dialogue. From the Michael Vick story, to support the troops, from military bases to frisson of naked power. The creation of a deeply aggressive and resentful population — perhaps primarily male, but including both genders is reflected in and partly created by the de contextualized barrage of violent imagery. The US military (and its subcontracted private security firms) are made up of video game soldiers. Men and women without any historical awareness, class consciousness, or relevant outlet for their inarticulate frustrations and anger. I point again to the US support for the death penalty as an expression of this anger. Vengeance remains a popular theme in american popular culture. Vigilantism, militarism, and punishment are the main themes driving our ever more childish culture today. The US is an Empire, but not a traditional Colonial empire — it is, rather, (or tries to be) an economic empire with staging stations (forward deployment areas) for its military. These outposts are not part of the local system (like Rome or Great Britain in their Empire) but are purely there to enforce US dominance through force, much as the International Financial Institutions are there to dominate economically. When countries resist, or indicate a desire to step away from the control of the Empire, they are labeled as rogue states or dictatorships, and public opinion is worked up for support of a military response (assuming they can’t be beaten into submission economically). The US runs economically on its defense budget and military spending. It needs soldiers to toss into pointless occupations, into various wells of chaos and killing. It needs targets for its huge stockpile of ordnance. I’ve been feeling of late just how emotionally cut off most Westerners are to the real effects of violence. It’s a video game. Real flesh and real pain do not register (until it happens to you !). Modern weaponry contributes to this distancing. And aerial bombing is the ultimate expression of it (starting with Hiroshima). The new warrior class is everywhere, and it’s time to question it, especially (in my humble opinion) in popular culture. John Steppling is Senior Editor, Arts & Culture at Cyrano. He co-edits VOXPOP—Placebo Art with his colleague Guy Zimmerman. Posted in IDEOLOGICAL COMBAT, TOXIC CULTURE. Hi there, i am looking for info on online education but i am left wondering how is your post orship practice of our new Mortuary Cult at The Greanville Journal related to that ? .